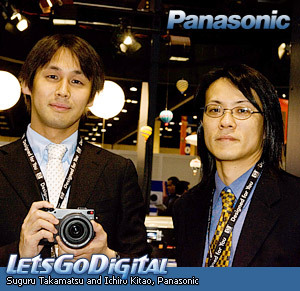 On February 28th 2006, at the Photo Marketing Trade Show (PMA 2006), held in Orlando we met Suguru Takamatsu, Coordinator Marketing Team Overseas Sales & Marketing Group and Ichiro Kitao, Product Planning Manager, from Panasonic. We took some time to set up a Q&A session at the booth from Panasonic, and asked Suguru and Ichiro about Panasonic's first digital SLR camera, the Lumix DMC L1. Question: Congratulation with the introduction of the Panasonic Lumix DMC L1. The whole world watched Panasonic unveiling its first digital SLR camera. Specifically what consumer group you are targeting with the new Panasonic Lumix DMC-L1? Answer: Thank you very much. The Panasonic Lumix L1 is not for the entry-level user, nor for the digital photography starter. We are also not aiming at the professional user although they may want to use the Panasonic L1 as a compact DSLR, giving them a convenient and small sized high quality camera in the field. We are aiming at the middle range of photographers, the advanced users. Question: What will be the biggest competitor of the L1? Answer: As far as the price range, although keep in mind that we cannot give you the actual price yet, we are aiming at cameras like the Canon EOS 30D and Nikon D200. At first we will be offering the Panasonic Lumix L1 in a kit, but we haven´t decided yet if we want to sell the body and lens also separately. This will depend on the demand and reaction of the market. To be realistic, we don't expect to sell many and many of the new Panasonic L1 digital SLR camera, so it will be unrealistic to predict any high sale numbers. It is our first DSLR product, but off course it is our wish that it will sell very well! Question: The new Leica D 14-50mm f/2.8-3.5 lens has the Mega O.I.S built-in. One of the advantages of the FourThirds system is that all lenses are compatible with each camera. Does this mean that the Mega O.I.S will also be available on the Olympus digital SLR cameras? If so, what is the key selling point why someone has to choose Panasonic above Olympus? Answer: The Mega O.I.S will be available for Olympus users as well if they are using the new Leica D lens. However, we have incorporated two modes of Mega O.I.S. 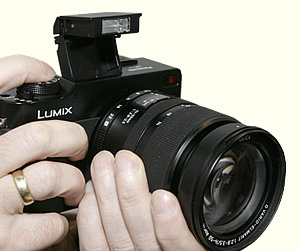 Both will work in combination with our Panasonic DMC L1 camera, but mode 2 will not function on other brand cameras. This Mega O.I.S mode is communicating with the camera itself, and this is one feature the Panasonic differs from other brands. With mode 1 the O.I.S is always working and is mainly focusing on eliminating hand shake. With mode 2 the O.I.S will be activated when you push the shutter button. Question: Will Panasonic be using their own RAW format, or will it adept to the Adobe's DNG standard? Answer: That is to be decided yet. If it is better to use the DNG standard we will certainly do so. But we haven't made a decision at this point yet. Remember the Panasonic Lumix DMC L1 as we have shown you is one the 5 pre-production samples we have in the world. The functions, ergonomics and features are not final yet. Question: The press conference mentioned that the new Live MOS sensor handles low light situations more effective. Can you explain why? Answer: The sensor can produce very high quality images where noise is not a big issue. Without getting into too much technical detail the major reason is that the combination of Live MOS and power consumption or CCD and power consumption is with the Live MOS sensor far more efficient. Question: Does the Panasonic Lumix DMC-L1 use the same live view as the Olympus E-330? And what is the main purpose of live view on a D-SLR? Answer: The live view of the Panasonic L1 will be slightly different. We are not using two kind of image sensors. The only live view we offer is with the mirror locked up. Olympus is also using a second sensor that receives the light via a second mirror. Live view is not meant to replace the optical viewfinder for normal use. It will become handy for special photography as macro photography and low angle shots. It gives our end-users a little extra. Question: Can we expect more lenses of Leica/Panasonic with Mega O.I.S? Answer: Of course the new Leica D lens is a very interesting lens and it is to be expected that more lenses will follow. However, it has yet to be decided which kind of lenses will be developed and with what kind of specifications. It will not be necessary to develop every lens with O.I.S on board. For some lenses image stabilization is not necessary and will only add more costs to the development. Question: The new Panasonic Lumix DMC-L1 digital SLR incorporates a new image processor, the Venus Engine III. What is the benefit of this processor? Answer: Our new Venus Engine III image processor is able to detect a variety of noise types separately. With this Venus processor we will be able to reduce this noise very effective which will result in better image quality. Question: How about the price and availability? Answer: At this moment we are not in the position to give you an actual price, but as mentioned before we are targeting at the group of Canon EOS 30D and Nikon D200 users. We hope to be able to make the Panasonic Lumix DMC L1 available around Photokina (September 2006).